Victoria will be taking part in Greece Is The Word!, a celebration of modern Greek culture and a cutting-edge, creative response to the Greek crisis. Others participating in this one-day event include historian Bettany Hughes, BBC correspondent Paul Mason and a pantheon of Greek stars for a lively day of debate and performance. 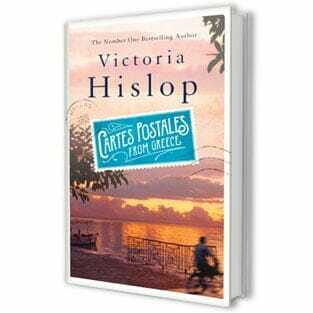 Victoria, whose ‘Greek novels’ The Island and The Thread have sold millions round the world, talks about modern Greek literature and the challenges facing writers in a country where publishing and bookselling have collapsed. She’s joined by top Greek novelists Ioanna Karystiani (Back to Delphi), Alexis Stamatis (Bar Flaubert), Dionysis Kapsalis, Vassilis Amanatidis and David Connolly for readings and chat. Enjoy poetry from inspirational performer Katerina Iliopoulou, comedy from brilliant stand-up Katerina Vrana, top analysis from journalist Maria Margaronis and lyrical literature from Ioanna Karystiani and Alexis Stamatis. Greece is the word is supported by the European Commission and by Arts Council England.